I truly believe that because of what I walked through(the adversity, trials, storms, obstacles) and was able to overcome in life is why I am able to coach people to overcome and perform at such a high level. I don’t coach you on what I think is a good idea, but what I did that worked for me to WIN IN LIFE. I created this “GET STARTED” 3 step simple process as a free resource to help you BE YOUR BEST and WIN IN LIFE! You don’t get what you want in life, you get who you believe you are. How you view YOU and what YOU are capable of can change everything. Starting today I want to give you the start of how I created “Coach JC” and how you are going to create THE BEST version of you. You will increase your self-esteem and shift how you view you! This will improve your self-image and how you believe others view you. Your thoughts create your belief, which determines your attitude. Your attitude dictates your actions which produces your results. The results you get over and over again create your life. So how do you train your thoughts? By what you SEE, what you HEAR, and what you DO. 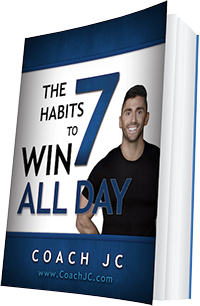 It takes 21 days to build a habit. It’s about the small simple disciplined things we choose to do each day that produce the wins. Below you will see 3 Steps. Step one is about what you are watching, it is you SEEING IT. Step two is about you HEARING IT. Step three is about what you DO. Just follow these 3 simple “GET STARTED” steps to WIN ALL DAY! Coach JC’s WINNING WORD OF THE DAY are short powerful, high energy Youtube videos that will inspire you to elevate your thinking, challenge your beliefs, empower your emotions and motivate you to take action. 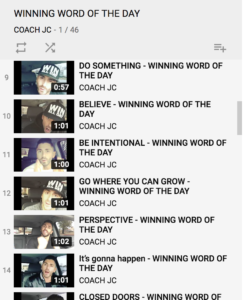 Watch one WINNING WORD a day and receive the message that Coach JC has for you. Now available at the iTunes Store. 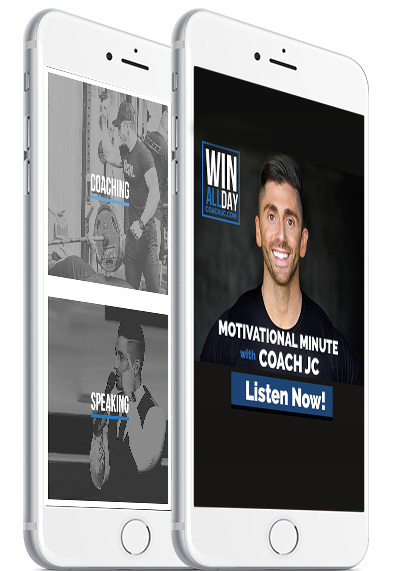 Coach JC’s Motivational Minute Provides a fee resource so you can hear and confess the riht thing in your life. 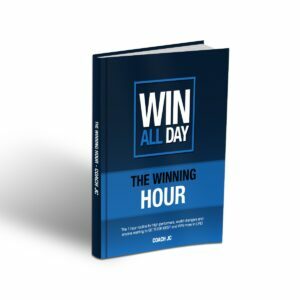 if you needsome motivation to BE YOUR BEST personally or professionally, in only 60 seconds each day you will be motivated and inspired to WIN more in life.